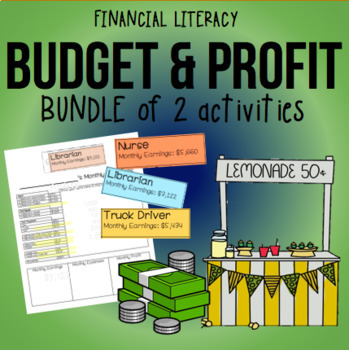 Bundle contains 2 activities plus one bonus Kid-Friendly BUDGET printable! 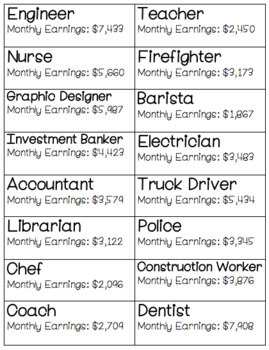 Each student uses their JOB CARD to create a monthly budget based on their monthly salary. This gives students practice estimating, adding and subtracting as well as experience with wants vs. needs. Important vocabulary needed prior to this activity: INCOME, EXPENSE, BUDGET, SALARY, MONTHLY vs. WEEKLY, PROFIT, EARNINGS, MORTGAGE, FIXED vs. VARIABLE EXPENSES. 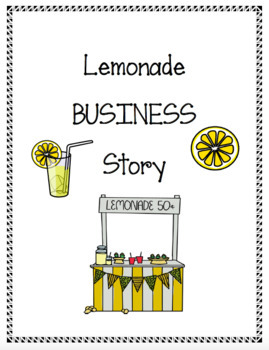 Includes 3 differentiated versions of the Lemonade Stand word problem which can be used for whole group lessons or small group interventions. 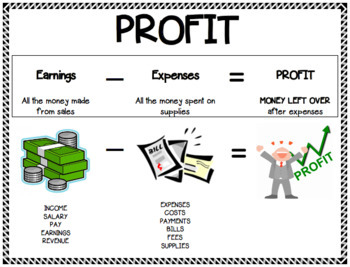 Printable PROFIT anchor chart included to calculate profit.